Rosie is watching to see how Jeffie handles this waiting game for treats. He is so her mentor. They are so sweet together it makes my heart melt. Great picture. Wait a minute? Waiting for treats? Watch and learn Rosie! I bet Jeffie has some good tips to show you! Rosie has such a look of concentration! Cute - Maggie is like that with Jack - watches every move he makes - and then mimics it. Ah Rosie, you are learning from the best!! Waiting for treats is always so HARD!!! haha I love it! so cute! Cute! Love the little heart shape on top of Jeffie's head. :) Happy WW! We're all watching and we don't see the point (us dogs). Treats are meant to be given - hear hear! Give them the treats already, Miss Sue!!! 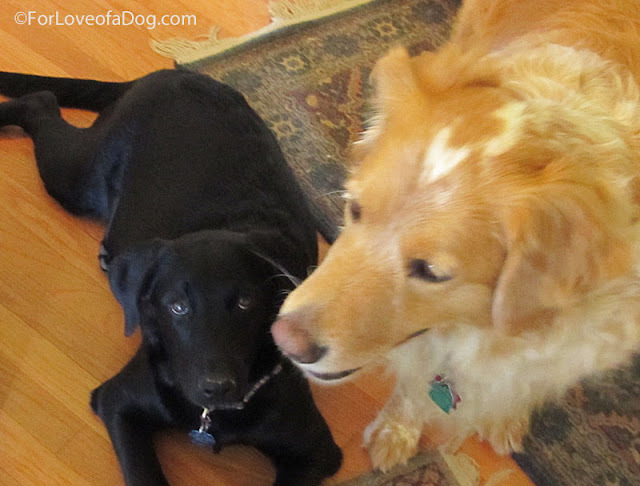 Oh boy...learning from each other can be dangerous for the humans in the house! Would love to know what Rosie is thinking! Looks like some words of wisdom might be in the works! Smart! Pierson learned a lot of his first tricks by watching Maya.